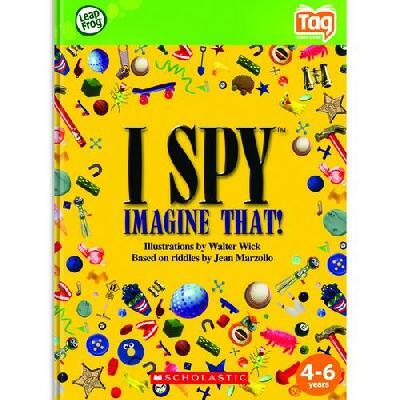 Tag Activity Storybook: I Spy Imagine That! Tag Activity Storybook: I Spy.. I Spy Imagine That Age 4-6..
LEA1070: -Activity storybook is filled with pictures and riddles that use your mind and eyes. -For ages 4 to 6 years. -After solving the riddles, play leveled learning activities that help build phonics skills, vocabulary and reading comprehension. -Characters, pictures and learning activities spring to life with every touch, immersing children in the thrill of reading. -When you touch the Tag Reader to the pages of this specially printed activity storybook, a small camera in the tip reads the pages, enabling children to hear words and stories read aloud. -Connect the Tag Reader online to the LeapFrog Learning Path to see what your child is learning. -Manufacturer warranty: 90 days.